We all know how important it is to wear protective sunglasses during summer, however, what most of us do not realise is how equally important it is, if not more so, to wear protective eyewear during the cooler seasons. Furthermore, 90% of UV radiation can penetrate clouds, which makes wearing sunglasses all year round even more important – dull days can be just as damaging. Another interesting fact and unknown to many is that UV exposure to the eyes is maximised between 8am-10am and, 2pm-4pm when the sun is lower in the sky often making these the most important times to be wearing your sunnies to protect from UV and give comfort from glare. 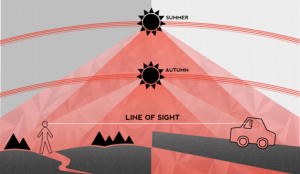 Check out our latest infographic on how to protect your eyes from the sun.